On December 8, 1906, President Theodore Roosevelt celebrated the passage of the Antiquities Act by declaring four sites of historic and cultural significance as our nation’s first National Monuments. 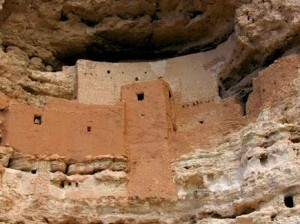 Among these was Montezuma Castle, which the President identified as a place “of the greatest ethnological value and scientific interest.” Although very few original artifacts remained in the structure due to intensive looting of the site, Roosevelt’s decision assured the continued protection of one of the best preserved prehistoric cliff dwellings in North America. Montezuma Castle National Monument quickly became a destination for America’s first car-bound tourists. In 1933, “Castle A”, a 45-50 room, pueblo ruin was excavated, uncovering a wealth of artifacts and greatly enhanced our understanding of the Sinagua people who inhabited this riparian “oasis” along Beaver Creek for over 400 years. Early visitors to the monument were allowed access to the structure by climbing a series of ladders up the side of the limestone cliffs. However, due to extensive damage to this valuable cultural landmark, public access of the ruins was discontinued in 1951. Take a stroll through time, while enjoying the canopy of trees that shade the walkways, as you gaze at the amazing cliff dwellings, or walk over to the adjoining creek to learn how the Sinuagua people relied heavily on this precious water source for survival. Now, approximately 350,000 people a year gaze through the windows of the past during a visit to Montezuma Castle. Even 600 years after their departure, the legacy of the Sinagua people continues to inspire the imaginations of all. Posted on July 29, 2014 by League Staff in The Great AZ Road Trip | Tags: Arizona, Campe Verde, Historic, tourism, Verde Valley | permalink.